Makana Henry nominated for Tom Pate & Jake Gaudaur Veterans’ Award - New World Agency official website | New World Agency is a sports management firm that aims to provide elite athletes with unparalleled professional representation in North America’s most competitive and lucrative sporting associations. Makana Henry did his research. The Saskatchewan Roughriders defensive tackle admitted with a chuckle that he went online after being nominated for the Jake Gaudaur Veterans’ Award to find out more about the former CFL commissioner and the award that’s named after him. Henry no doubt discovered that the award is presented annually to a Canadian-born CFLer “who best demonstrates the attributes of Canada’s veterans: Strength, perseverance, courage, comradeship and contribution to Canadian communities,” and that Gaudaur was a veteran of the Second World War who eventually became the CFL’s longest-serving commissioner. Each team nominated one player for the award, which is to be presented Thursday during the Shaw CFL Awards show — one of the off-field events to be held during Grey Cup Week in Edmonton. Henry called the nomination “a big step” for him. 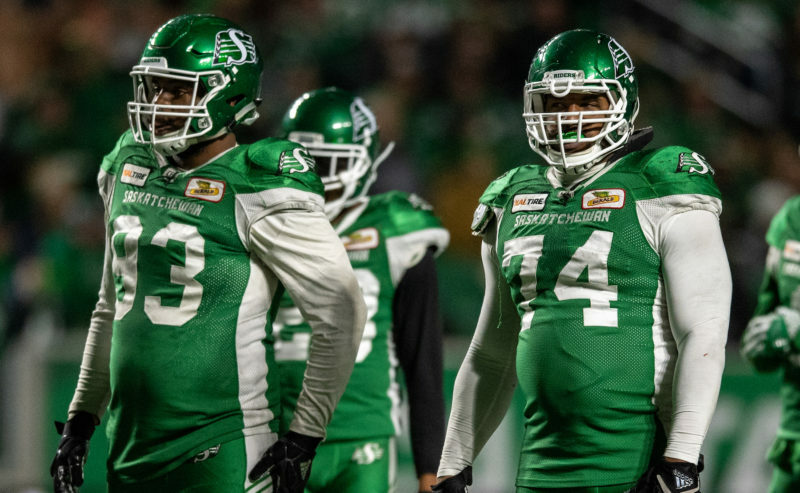 Henry just completed his third season with the Roughriders, who signed him as a free agent in August of 2016. His resumé only featured previous stops in junior, flag and semi-pro football, but the Roughriders’ coaches felt the 6-foot-1, 275-pounder could help them. In 2018, an ankle injury limited Henry to 10 games played, during which he recorded 15 tackles and one sack. He didn’t play in the Roughriders’ 23-18 loss to the Winnipeg Blue Bombers in the Western Semi-Final on Nov. 11. But Henry’s off-field work is what has garnered him the most attention. He basically has adopted Scott Collegiate as a pet project, playing sports with students, working with them during fundraising activities and even borrowing a video camera to film basketball games in hopes of helping one student get a college scholarship. Henry also has organized an annual campaign among the Roughriders to buy backpacks and school supplies to donate to Scott’s incoming Grade 9 students. Much of Henry’s motivation comes from his own challenging past. Now he’s hoping to help Regina’s inner-city youths avoid the issues that affected him during his youth. Henry’s work away from Mosaic Stadium also has led his teammates to nominate him for a second straight season for the Tom Pate Award. Presented annually by the CFL Players’ Association, that award goes to a player who displays sportsmanship and who has made contributions to his team, his community and the CFLPA. That means Henry — whose 31-game career has been spent primarily as a backup — has been nominated for three community-based awards in the past two seasons. And why is giving back so important to him? “So many times in life, people turn away from the simplest little things that they could do — and you never know what those little things can do,” he replied. “They may seem small to some people, but they may impact other people’s lives in a big way. Henry has seen his affiliation with Scott pay dividends — and not only in terms of backpacks and basketball. 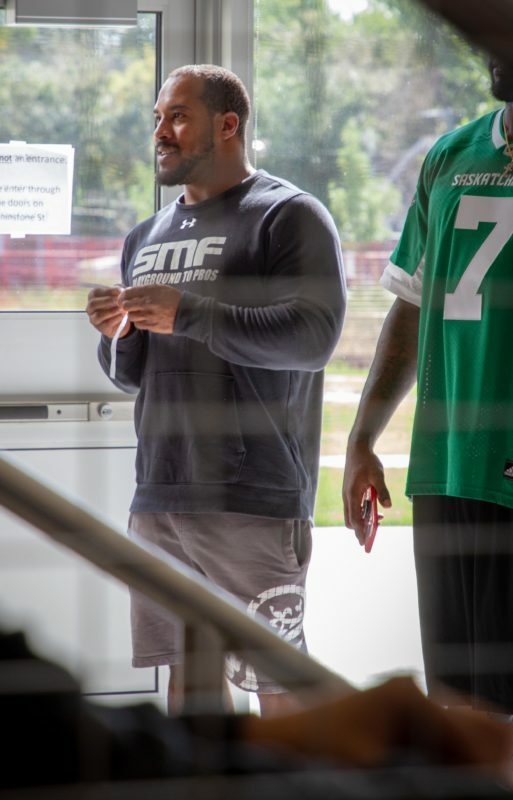 One youth with whom Henry interacted was a member of a gang before he spoke with the Roughriders’ defender. The other nine finalists for the Jake Gaudaur Veterans’ Award are Rolly Lumbala of the B.C. Lions, Ryan King of the Edmonton Eskimos, Junior Turner of the Calgary Stampeders, Andrew Harris of the Bombers, Mike Daly of the Hamilton Tiger-Cats, Declan Cross of the Toronto Argonauts, Jean-Philippe Bolduc of the Ottawa Redblacks and Martin Bedard of the Montreal Alouettes. For Henry, it truly is an honour just to be nominated.